The Rams are a very good team, deep in talent and according to many writers a legit Super Bowl contender. They will be a great measuring stick for the Ravens to see if they have improved and are moving forward to being a better team than last years squad. We have heard all the positive camp reports and of course I want to hear that and buy into that. I'm a fan. Yet after following this game all my life I also know better. All around the NFL fans are gushing about their teams...because reality hasn't struck. And I know this is a meaningless preseason game. It doesn't count. It will be forgotten. Most of them are boring. What draws me is Competition. That isn't meaningless to me. I don't care if it's our slappies Baltimore Slappies, competing against some other cities slappies. They are Our Slappies!...in a sense. Baltimores! BTW...I'm an old...gulp...Baltimore Colts fan. 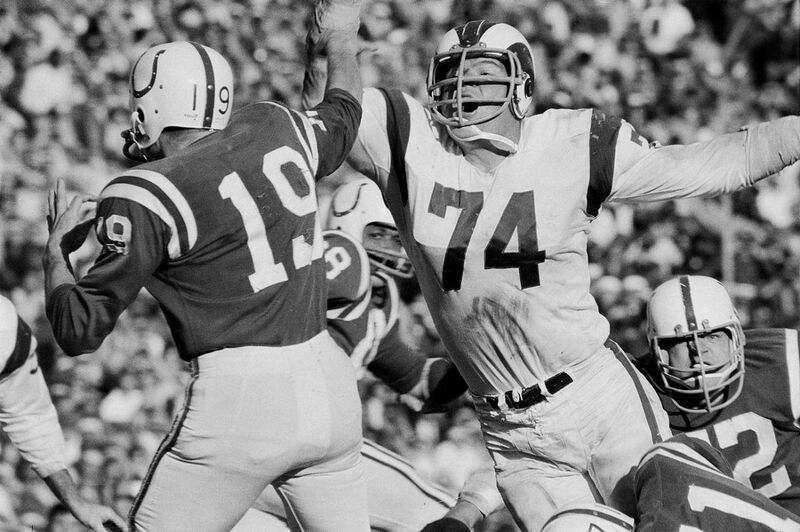 The Rams had some great teams back in the day and the Balitmore Colts/Rams games were slug fests. So how will this years Ravens perform against a very good Rams team? The Rams have an excellent D line and secondary. The Ravens receivers have to show that they can get open and make plays. Doing it against the Ravens D day in and out is one thing. They are used to each other. Doing it against the Rams is a whole different level. The Ravens O line will be missing Yanda and could get pushed around tonight and wreck any chance for the passing game to take flight. Joe won't have time to throw. Will the Ravens be able to run? Will the linebackers be able to cover? The Ravens are looking for a punt returner. Tucker's another one to watch. He's been missing some kicks in camp. Yea...everyday it seems like one. So I have a Tucker watch. I want to be able to comfortably leave my seat to go to the bathroom as he trots out onto the field. There's a ton of Ravens players who I'm interested in watching...known and unknown. Will this be a sloppy, ugly 10-3 game? I'm kind of tired of playing ugly. I'll be looking for some hope, some improvement over last years roster. Not looking forward to work tomorrow on little sleep. Edited by vmax, 09 August 2018 - 11:36 AM. Hope I'm wrong but I think we're in for a difficult game. The Rams are loaded with talent and our O-line is undermanned without Yanda. I'm seeing our qb's running for their life early in the game. Maybe all game. Tucker's misses are disconcerting. The usual trajectory for kickers is to get better with experience. Our receivers will do OK. They'll do even better if Joe remains standing under a fierce pass rush. Yes, I remember Merlin Olsen. How about when George Allen coached the Rams? Or even earlier, remember Roman Gabriel and Bill Wade? I mean, I'm old man! The "Fearsome Foursome" were indeed something to fear. The 1967 Baltimore Colts season was the 15th season for the team in the National Football League. They finished the regular season with a record of 11 wins, 1 loss, and 2 ties, the same record in the Western Conference's Coastaldivision with the Los Angeles Rams. However, the Colts lost the tiebreaker based on point differential in head-to-head games and thus did not make the playoffs. First real fake game, I mean 2nd official preseason game. I doubt starters go more than 1 series, could be wrong. Still, no much of a measuring stick as most players only go half out for most of the plays. Nice read Max. I can remember the first Colts game I ever went to. It was against the L.A. Rams and it was really cold blistery day at Memorial Stadium. First play from scrimmage, Unitas dropped back and hit John Mackey across the middle for about 30 yards. Mackey broke a couple of tackles and went all the way and just like that we were up 7 zip. As far as this season goes, I got a gut feeling that we're going to do better than is expected. Playoffs baby. Really fun night at the game. Beautiful summer evening. Stadium upgrades are great. The new scoreboard is impressive with live updates from around the league. Also the food prices are much more fane friendly. $20 bought us a lot. The Joe and Lamar show was very encouraging. The disappointment was the Rams did not play their starters so I'm taking Prestons advice and drinking diet Purple Kool Aid. Yet Joe was very sharp and in one series hit multiple receivers leading the opening drive to Ricards TD. Lamar put some sick moves on the Rams on his TD run. Moore made a spectacular catch and Perriman shinned albeit against 3rd stringers. Williams was awesome. Running off to work now....little sleep, but I'm sick of being a responsible adult all the time... once in a while being irresponsible is ok.
Well, the offensive line is clearly still a big weakness, even against 2nd & burger flippers. Jackson still struggles to read defenses, maybe they told him not to since the Rams ran back ups and straight vanilla, I don't know, but if he can't learn to read them, presnap, he won't make it in this league. Moore's catch was fantastic, the pass never should have been thrown, but what ever. He clearly has been working hard on his hands that were suspect coming out of college. Brown Jr had a pretty good night, a bit up & down, he still over reaches on smaller defenders, but he pulled off a great push & switch on a late blitz that provided Lamar more time on one play. Jr has a long way to go with his footwork, ..
My eval is. I like Joe throwing for the chains. It has been a long time coming. I think his TD throw was not the best ball. Jackson moves well but he needs a lot of work. GR3 looked pretty good. I think he needs to be the starter if Joe goes down. JAckson should be the official #2 to get the few reps he can get at practice. Perriman looked pretty good for a change. I was looking for flying pigs outside. The catch before the TD was really good. The TD catch was a nice adjustment by him. He needs to catch it with his hands though. The Run game looks really good. The D looks stiffling. The reserves started letting up in the run game later but some guys like Seiler looked very promissing. So I'm there basking in the glow of a great showing by the Ravens when Preston removed my purple sunglasses and took my kool-aid away. The Ravens looked terrific for sure but it really has to tempered by the fact that LA basically decided to use the game as a scrimmage for the 2nd and 3rd team backups. So I'm holding off judgement for a few more games. Perriman almost made me choke to death on a nacho on his TD reception. But, he has a long road to go before I get too excited. Chris Moore and Hayden Hurst look like the real thing. Lamar was Lamar...great running ability, inconsistent passing. He needs a lot more work but he certainly has potential. Nice to see Flacco look like an NFL quarterback for a change. He has to do this week in and week out. Positive vibes tempered by the lack of quality opposition. BTW I agree we have to keep 3 qb's this year.